The story of Operation Wisdom begins in early 2000 on the crowded streets of Accra, the capital city of Ghana. Kennedy Aboagye (then 22) is living in the city selling plastics on the streets with his younger brother. On weekends, he leads a Sunday School class at his church. An acquaintance sees that he is good with children and tells him of a plan. He knows of an area, not too far from Accra, that lacks even a single private school. The public schools are failing and the parents are starving for education. They can start a school there says the acquaintance; it will be easy. Aboagye will handle the educational aspects of running a school; the friend will handle the financial side of things. They both move to the Akuapem Hills to start their new school. One year later, the acquaintance is gone. The school never took off like he had planned. It was a failed business attempt from the beginning, he tells Aboagye. "The people just don't appreciate education enough to pay for it." Aboagye stays. At nights, when the electricity ceases to exist, he can see the capital's bright lights from the darkened hillside. Always the city's lights are on, taunting Aboagye to return. Aboayge decides to try the school on his own. He goes from house to house asking for children. Most of the families laugh him off their property, saying he is too young to start his own school. He tells some of the parents he will teach the first semester for free so they can judge the fruits of his labor. Five families agree. He starts a pre-school. He names it Wisdom Academy. The parents notice that their young children are learning English at an accelerated rate from Mr. Aboagye. The school's enrollment begins to grow quickly. Other parents also notice that he can't turn a child away from his school, even if the child lacks the necessary fees. By 2005, over 50% of the children are attending Wisdom Academy for free or for a reduced rate. Wisdom's population grows from five to over 100. Each year, he adds a new grade. Soon he outgrows the room he had been renting, so he buys a plot of land in the center of Kitase and builds a new school by himself. Every rain season, the school will fall down and nearly disappear. Each time, he builds it again. From the outside it looks like a failing school. From the inside, the children continue to learn. Without the children's fees, Aboayge is unable to pay his teachers on time. He learns about a volunteer program that brings volunteers from America to teach for free. In 2005, three friends volunteer at Wisdom Academy for a semester. They are inspired by Aboagye's vision and perseverance. They are moved by their student's devotion to education. They are amazed by how far their money can be stretched with ingenuity and hard work. They return home, and they vow to continue helping. The three friends begin a volunteer program to recruit like-minded individuals and collect supplies from local schools to send to Ghana. Minor improvements are made, but they find it difficult to raise money for the small school located in a tiny village in an obscure country in a troubled land. They brainstorm alternative sources for funding and begin getting the majority of their support from an unlikely place - students. A group of New York high schoolers stage a concert to raise $1,000 for Wisdom Academy. In Massachusetts, a community service club at an elementary school gets involved as well. Boxes of supplies are donated, hundreds of dollars are raised. One young girl asks for school supplies for her birthday, so she can donate them to Wisdom Academy. The seeds of Operation Wisdom are sewn. The three friends return to Ghana. Two of them spend half of the year back in Kitase. With support from past volunteers and a handful of American schools, they are able to help Wisdom Academy purchase a "school bus.” Now families from the surrounding villages can have a choice in their children's education. In 2007 alone, more than 100 new students enroll, most of them coming from outside of Kitase via the bus. As a result, the schools population more than doubles from 2006-2008. By 2009, Wisdom Academy is a self-sustainable school. Aboagye has a full staff and no need for volunteer teachers. The population, at over 300, has outgrown Abaogye's hand-made school. He needs to expand. He needs to build up. With a little help from past volunteers and a big loan from the nearby bank, construction of a new, modern learning facility begins. Aboagye's vision is nearly realized. Meanwhile, back in America the three friends have turned their network of volunteers and partner schools into a non-profit organization that seeks to teach young people about global issues and, in return, have them think of creative solutions to help schools in Ghana. Inspired by the school and the vision that Aboagye started a decade ago, they call the organization Operation Wisdom. By 2012, the volunteers have begun their own careers in education and Operation Wisdom begins to take root in their schools. 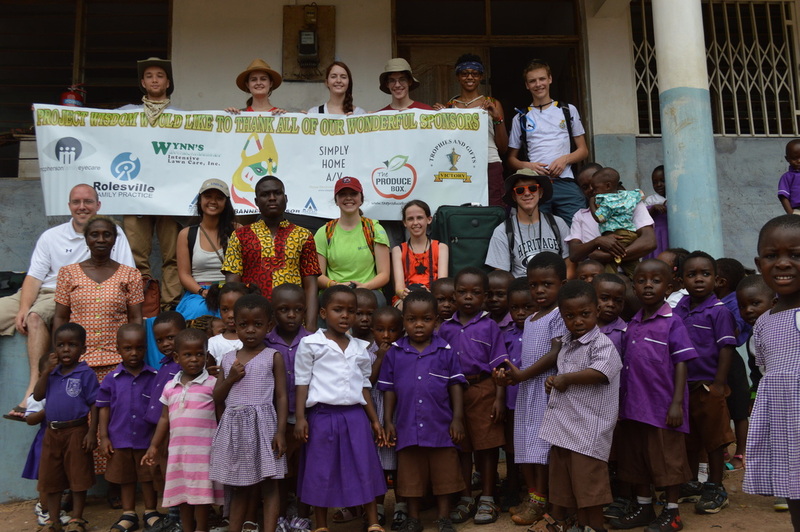 In 2013, Operation Wisdom develops its signature program which brings high schoolers to Ghana for a ground-breaking program that combines global studies, experiential learning, and community service. Twelve high school students leave the familiar confines of American soil and travel to Ghana for the inaugural Operation Wisdom trip. The students come face to face with global poverty. They learn from grassroots organizations and global entrepreneurs. They volunteer with the West African AIDS Foundation and with Wisdom Academy. Their lives are changed -- 100% of the students surveyed report that they are more confident in a leadership position and that they are more comfortable in unfamiliar environments. The program spurs a grassroots movement at Heritage High School in Wake Forest, North Carolina. Soon a club and a class are developed at the school, and students raise over $1,500 for Wisdom Academy, "the small school in the tiny village in an obscure country in a troubled land" that started the vision of hard work, ingenuity, and global partnerships nearly a decade ago.